Nanobeads are all around us, and are used in many products from sunscreen to white paint. A new revolutionary application is revealing hidden aspects to these beads. A research paper provides proof of a new concept, using new solid 3D superlenses to penetrate the scale of things formerly visible via a microscope. The superlens was so powerful the researchers were able to see the actual data located on the surface of a Blue Ray DVD. As previously thought the shiny surface is not smooth. The existing microscopes are not capable of seeing the grooves holding the data, however now it is possible to even view the data itself. The research team was headed by Dr Zengbo Wang at Bangor University, UK and Prof Limin Wu at Fudan University, China. 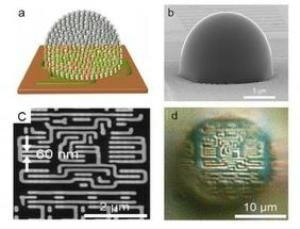 They developed tiny droplet-like lens structures on the surface to be analyzed. These serve as an extra lens to magnify the surface features formerly invisible to a normal lens. Comprising of millions of nanobeads, the spheres split up the light beam. The light is refracted by each bead, behaving as independent torch-like tiny beam. It is the minute size of each beam of light that lights up the surface, widening the resolving capability of the microscope to record-breaking heights. The new superlens increases 5x magnification on top of the currently available microscopes. Widening the limit of the resolution of traditional microscope has been considered the 'Holy Grail' or 'El Dorado' of microscopy for more than a century. The physical laws relating to light make it impractical to view objects measuring less than 200 nm - the smallest size of bacteria, using just a regular microscope. Since the turn of the millennium, superlenses have been the new goal, with many labs and research teams exploring varied materials and models. We've used high-index titanium dioxide (TiO2) nanoparticles as the building element of the lens. These nanoparticles are able to bend light to a higher degree than water. To explain, when putting a spoon into a cup of this material, if it were possible, you'd see a larger bend where you spoon enters the material than you would looking at the same spoon in a glass of water. Each sphere bends the light to a high magnitude and splits the light beam, creating millions of individual beams of light. It is these tiny light beams which enable us to view previously unseen detail. Wang believes that the results can be easily reproduced and that other labs will adopt the technology and use it. The key benefits of the technology is that the material - titanium dioxide - is low cost and easily available, and the lenses are applied to the material to be viewed, instead of to the microscope, eliminating the need to purchase a new microscope. We have already viewed details to a far greater level than was previously possible. The next challenge is to adapt the technology for use in biology and medicine. This would not require the current use of a combination of dyes and stains and laser light- which change the samples being viewed. The new lens will be used to see germs and viruses not previously visible.